Hello from Lucerne (Luzern)! It has been a busy couple of weeks prior to our arrival here in Switzerland just a few days ago. I wish I could keep this short, but the first week alone was enough for a lengthy and long overdue update. It’s hard to believe Ellen and I are just over halfway through a month of training and racing in Europe. So far we’ve done it all: Planes, Trains and Automobiles…and let’s not forget the important one, Boats. It’s been a ton of fun, exhausting, and at times stressful and difficult; but most importantly, we’re getting the valuable race experience we came here for. 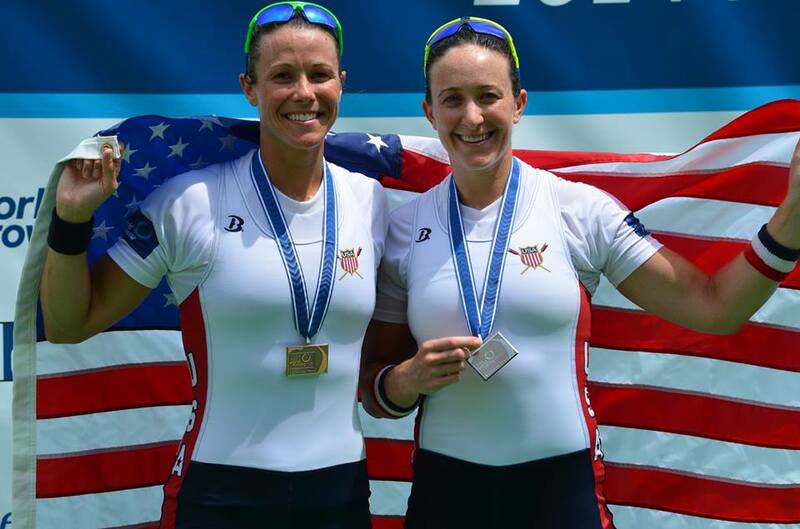 Our “Eurotrip 2014” began on Saturday, June 14 with our traveling companions, the lightweight women’s double of Devery Karz and Michele Sechser and our coach Jeremy Ivey. We took a very early morning flight out of Oklahoma City to Newark, New Jersey where we enjoyed a six hour layover before departing for Geneva, Switzerland later that evening. Best way to kill that much time? Find a local gym that will accept guest day passes and squeeze in a solid workout and shower. Seriously. Best decision ever. The workout itself broke up the grogginess of a full day of travel as well as got the endorphins flowing so we didn’t feel as terrible after the eight hour flight filled with crying children, variable sleep, mediocre food, and dehydration. And as elite rowers, days lost to traveling oftentimes equates to missed valuable training days so it was great to feel like we hadn’t wasted an entire day. Special thanks to ClubMetro Newark for supporting Team USA and welcoming us into their fitness facility! After landing in Geneva on Sunday morning (June 15), we met the rest of the USRowing conglomerate who had traveled on a separate flight, before loading onto a large tour bus that took us an hour and half south across the border into France to the small town of Aix-Les-Bains nestled in the Alps region on Lac du Bourget. Including all athletes, coaches, and other related personnel, Team USA included about 50 people total, one of the larger groups we’ve traveled to a World Rowing Cup. 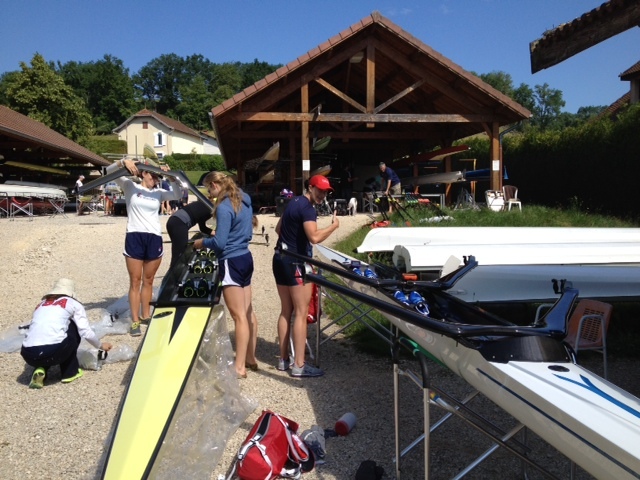 Rigging the boats for training at Aviron du Lac Bleu in Paladru, France. World Cup 2 took place on the beautiful Lac d’Aiguebelette June 20-22. The course didn’t open to outside countries for training until June 18 which posed a problem for getting those critical first strokes in to adjust to a new boat, new water, and shake off the sometimes paralyzing jet lag. Fortunately, we had arranged to train at an alternate location out of a nearby (and very hospitable) club, Aviron du Lac Bleu located in Paladru for the two days we weren’t allowed to be on Aiguebelette. It was about a 75 minute trek from the hotel which made for long days, and the open water and variable conditions made for bumpy rowing, but we made it work. To put it mildly, the week leading up to racing didn’t go exactly as planned. (Really, in life when do things ever go exactly as planned?) Race week is already stressful enough so when you hit those bumps along the way, your blood pressure tends to irrationally skyrocket and the crazy eyes come out. Despite some challenging issues, by the morning of our first race Ellen and I were prepared and confident as we paddled to the starting line. The heats were unique in that they were conducted in a time trial format (as opposed to six boats across racing). At least once during each Olympic quadrennial, FISA will simulate the time trial to ensure officials and crews are prepared in the event that it may be necessary (most likely due to weather conditions that would prevent fair racing). This way of “racing” is not exactly ideal because you can’t truly gauge your speed off of other crews; you’re basically racing the clock, hoping you put up the fastest time. In our time trial heat, we took second behind Australia, a fast crew which had taken gold at the first World Cup in March. Our finish advanced us straight to the semifinals to be raced the next afternoon. The semifinal was a bit more exciting: side by side racing and we were lined up against a very fast Polish double–the 2014 European Champions–along with Great Britain, China 1, China 2, and Finland. We needed to place in the top three to qualify for the A Final as well as secure our seats on the 2014 United States National Team. This was a big one. We fought our way down the course, neck and neck with Great Britain trading places for second and third, finally passing through them in the last five hundred to take second, less than half a length behind Poland in first. We were pumped. We had raced well enough to make the A Final and to be awarded a decent lane as well as officially punched our tickets to the 2014 World Championships! The A Final took place on Sunday, June 22. Our rowing had been coming together better and smoother with each day as we settled into the new boat and fine-tuned some tricky rigging. Having officially qualified for the National Team and with that little bit of weight off our shoulders, we were ready to lay it all out in the final which was stacked with nothing but strong, fast crews. 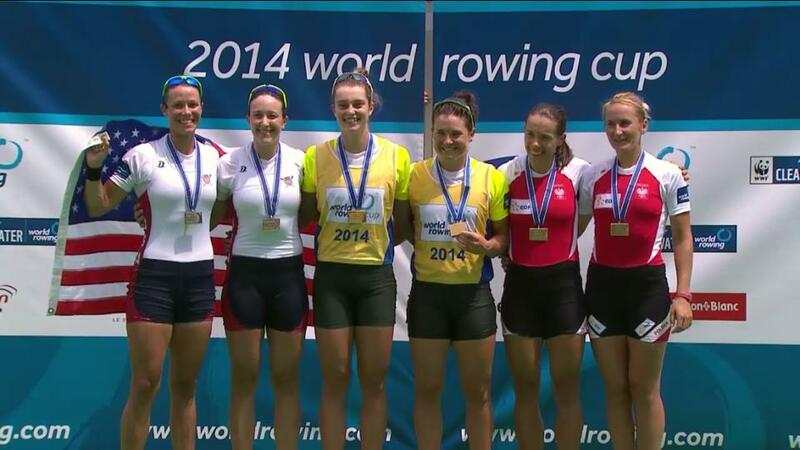 2014 World Cup 2 Women’s Double medalists (L-R: United States, Australia, Poland). From the competitive racing seen in the heats and semifinals, this race promised to be an all out battle to the line, six boats across. As we pulled into the starting dock in lane five, I looked to the left: the Netherlands, Belarus, Australia and Poland; glanced to the right: Great Britain. We blasted off the line at a 51 (insanity…thanks, Ellen), determined to stay up with Australia and Poland, who would surely be leading in the first 500 meters. As expected, the race was a 2,000-meter all out battle. Australia led from start to finish with Poland in second until we made a decisive push coming into the third 500. We made a run at Australia in the last 250 meters, finishing just a half length behind to take silver. All crews finished fast with first, second and third separated by less than a boat length and the entire field within seven seconds of each other. 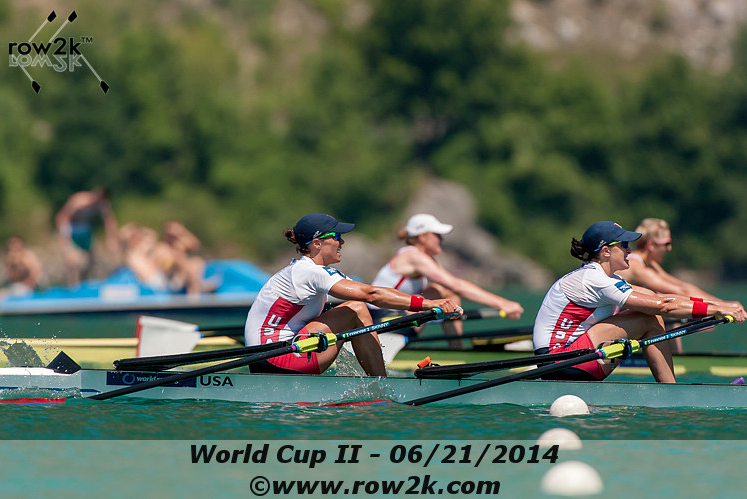 For Ellen and me, it was our second World Cup and best international finish as a crew. We were very pleased and proud of our performance and even hungrier to take that next step. Check out the replay of the race HERE. Following World Cup 2, the team packed up and flew to Amsterdam where we trained on the Bosbaan for the week and raced in the Holland Beker Regatta (June 28-29). Amsterdam is a very cool city. Ellen and I raced in the women’s double sculls event both days, going 4-4 winning each heat and final to take home two gold medals. Needless to say we were pretty tired after four races in 48 hours. The racing may have not been our prettiest, but it was a great way to get an early look at the Bosbaan where the World Championships will be held later this summer (August 24-31). The women’s double is shaping up to be one of the strongest, deepest, and most competitive fields the event has seen in several years. It truly is an honor to race against some of the best athletes in the world. There will be no “easy” races as crews will only get faster as we near the World Championships. World Cup 3 (July 11-13) is coming up in just ten days and the entry list for the women’s double is larger and just as fast (if not faster) than in France. Looking forward to another regatta filled with tough racing!